Off-the-shelf storage products are great as a simple solution to organizing your garage. 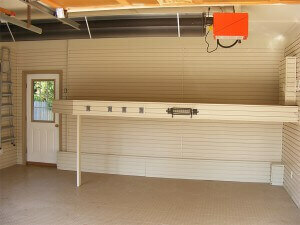 But custom-built storage can turn your garage into a room with truly functional storage and workspace. Just because it’s custom-built doesn’t mean it has to be more expensive. Having a storage unit designed specifically to fit an area of your garage often costs no more than buying a read-made product that may not fit as well in the space. If you’re a gardener, car-enthusiast or DIYer, a workbench is a nice addition to any garage. Workbenches can be designed to any size or shape. A workbench that folds up to be stored when you aren’t using it is a great space-saver for small garages. 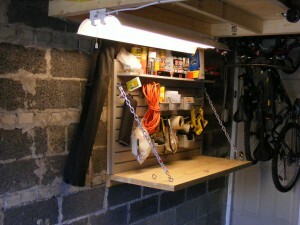 As I wrote in my previous blog, overhead storage is a great way to create extra space in garages with high ceilings. It can be as simple as a plywood platform to store seasonal items or as elaborate as a full mezzanine, which allows for another level of storage and workspace. Ladders or stairs are useful if you have a mezzanine or just need an easy way to access overhead storage. They can be designed to save floor space by pulling down when you need them and retracting out of the way when you’re done. 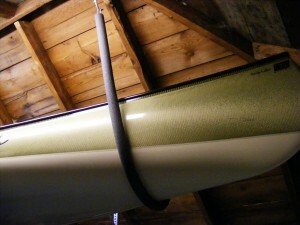 The best place to store canoes, kayaks or Thules is overhead. We build slings out of sturdy foam-covered chain with loop-and-eye hooks to safely and easily hoist these bulky items up and down. Having a custom-built baseboard in your garage not only looks good, it protects against water leaks and rot. Wood baseboards allow polyaspartic flooring to wrap up the sides of the drywall. Stamped aluminium is a great modern, industrial look and provides excellent water protection. There are often unsightly items in the garage that can benefit from being covered up. We’ve built boxes to cover irrigation systems, electrical panels and central vacuum canisters. 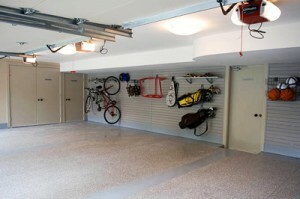 They can be finished to fit seamlessly into the rest of the garage design. As mentioned before, garages are rarely standard squares or rectangles. By having something custom-designed and built, you make the best use of all nooks and crannies and odd-shaped corners. When I visit a garage to do a consultation, or often when I’m on the job doing the renovation, I spot areas that would really benefit from a custom-built solution so I’d be happy to make a few suggestions. Finishes really up the wow factor in any garage renovation. We’ve done everything from finishing slatwall panels in an oak stain, in keeping with the cottage-look of the house, to installing custom wood worktops. We can even custom-mix paint chip colours to make the perfect shade of polyaspartic flooring. 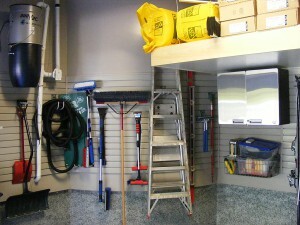 Have a look around your garage and see if you have any odd-shaped areas or things you want to change. If you do, a custom-built storage solution is what you’ll want to consider to maximize the storage capability of your garage.